Stocks are shares of ownership in a corporation. The stock market is a place where stocks are bought and sold. 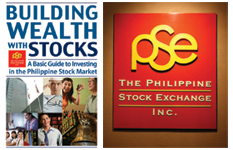 The Philippine Stock Exchange (PSE) is the corporation that governs our local stock market. People buy or invest in stocks to benefit from a company's tremendous value potential over time. Once you buy or invest into a stock you now become part owner or a shareholder of that particular corporation. How to make money in stocks? As a Shareholder, you can now participate in the company's growth and success through stock Price Appreciation and by earnings Dividends. Capital or price appreciation is an increase in the market price of your stock over time brought about by an increase in its potential value and the demand to buy its shares. The faster a company can grow, the faster its price can appreciate. Profitable corporations can also issue dividends, whether in cash or in additional shares of stock as a means for shareholders to share in their distributed profits. History has proven that investing in quality stocks can provide greater returns than most investment instruments. This offers you the best chance in achieving your financial goals and gives you the ability to later enjoy the benefits of your money working for you. The track record of the stock market also shows that a good basket of stocks climb more often than decline - reducing risk over the long-term. Another reason why stocks can outperform other asset classes is because it can compound the value of your investment. Companies can reinvest the profits they make to generate even more profit. 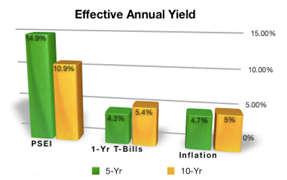 Moreover any dividends you receive can also be used to buy more shares and thereby enlarging your overall value as well. Discipline and the right methodology is the key to a successful stock investment program. Understand and adopt these four essential rules of thumb to keep you on track. Invest early to take advantage of compounding over a greater period of time. If I invest Php 25,000 at the age of 25 and I manage to have my investment grow by 8% a year, 40 years later my investment will be worth Php 543,000. If I invested Php 25,000 at the age of 25, allowing this to also grow by 8% a year, plus adding another Php 25,000 every year thereafter until I retire, I will eventually retire with an estimated Php 7 Million. Compounding and regularly adding to your investment is the key. Long term investing solves the problem of short-term volatility (choppiness in price). On occasion some issues may come up that may cause prices to swing up and down whether economic, political or natural events. 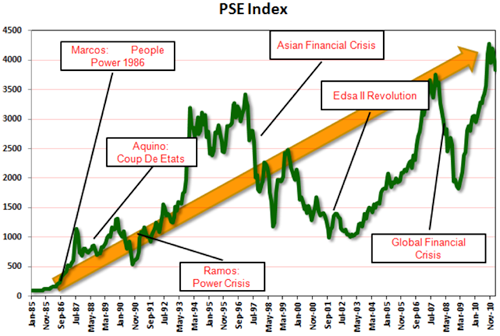 But you can see from the chart below that the PSE index always bounces back to new highs even through problematic times. After all companies need time to grow so prepare to sow your seeds in great businesses and let time do the rest. The management of risk should always come hand-in-hand with your choice of investment. One way of containing risk is through diversifying or by spreading investments around and away from one single asset class. As the saying goes, "Do not put all your eggs in one basket." Moreover try to allocate your capital evenly to a number of stocks in different industries or sectors so as not to put too much risk in one area; have a good balance in your investments.